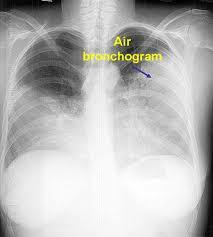 An air bronchogram appears when an infiltrate surrounds a peripheral bronchi, and is thus important in establishing lung consolidation. ARDS is a sudden and progressive failure of the respiratory system in which the alveolar-capillary membrane becomes damaged. Damage to this membrane makes it more permeable to fluid, which can lead to difficulty breathing, atelectasis, and hypoxemia that is unresponsive to oxygen therapy. 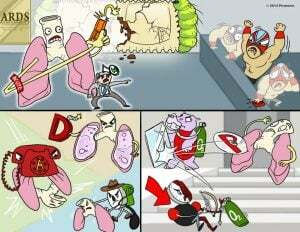 Patients who develop ARDS are typically afflicted by another illness or injury such as COPD, pneumonia, tuberculosis, aspiration, sepsis, shock, or fluid overload. Patients with this condition may also develop pulmonary hypertension, which is a late indicator of decreased lung compliance. Neonatal respiratory distress syndrome (NRDS) is a condition related to fetal lung immaturity in premature infants (<37 weeks gestational age) and a lack of surfactant. Infants with NRDS will exhibit signs of respiratory distress including tachypnea, nasal flaring, intercostal/substernal retractions, and audible grunting upon expiration. Interventions used to treat NRDS include administration of exogenous surfactant, oxygen therapy, and mechanical ventilation. It is important to note that infants with NRDS should not receive bottle or gavage feedings, as these may increase their respiratory rate and risk of aspiration. Instead, total parenteral nutrition (TPN) is used to provide the infant with adequate nutrients. A 32-week preterm infant has an APGAR score of 9 at 5 minutes. Thirty minutes after delivery, tachypnea, retractions, and expiratory grunting are noted. Cyanosis and dyspnea appear with little response to oxygen. Physical examination reveals poor air movement bilaterally. A chest x-ray reveals air bronchograms and a fine reticular granular pattern. Which of the following conditions should be suspected? Small areas of atelectasis usually are asymptomatic. While larger areas may present with similar clinical findings, the chest x-ray findings are not consistent with atelectasis. Chest x-ray in a patient with a diaphragmatic hernia would not show a fine reticular granular pattern. Chest x-ray in a patient with a pneumothorax would not show a fine reticular granular pattern. Clinical findings of increasing cyanosis unresponsive to oxygen therapy and the characteristic x-ray findings are most consistent with respiratory distress syndrome. A 36-year-old male who is hospitalized because of severe injuries from a motor vehicle accident develops rapid onset of profound dyspnea. Initial chest x-ray shows a normal heart size with diffuse bilateral infiltrates. Follow-up chest xray shows confluent bilateral infiltrates that spare the costophrenic angles. Which of the following is the best clinical intervention for this patient? Chest tube insertion is not indicated in a patient with ARDS. Fluids are the preferred treatment initially for hypovolemia. Type-specific packed cells are given when the patient's blood type is identified. Until then O negative packed cells are administered. Use of crystalloid solutions are preferred to avoid pulmonary edema. Marked hypoxemia is refractory to treatment with supplemental oxygen in ARDS. Tracheal intubation with lowest level of PEEP is required to maintain the PaO2 above 60 mmHg or SaO2 above 90% in a patient with ARDS.